Colombia’s counter-narcotics policy is on the brink of failure after more than 28 community leaders and almost 200 farmers were assassinated, according to the coca growers federation. According to COCCAM, the federation that represents peasants who grow illicit crops, the extreme violence adds to government failures to execute a peace process with the FARC. The peace process includes a program that seeks to replace coca for legal crops and invest in rural infrastructure. 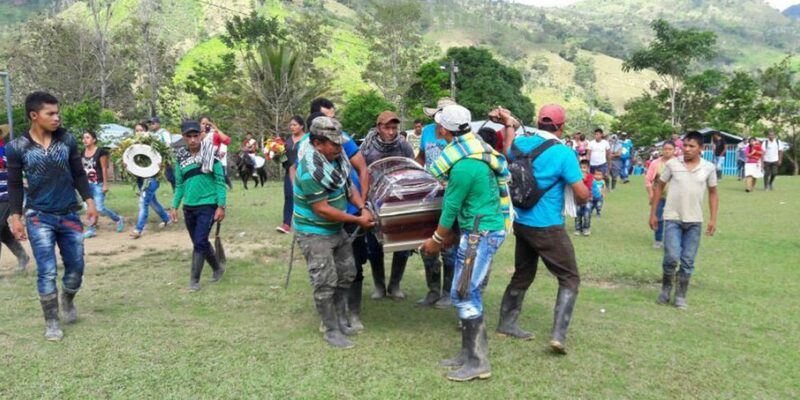 COCCAM said the 200 farmers had been killed since January 2017, adding that the violence was “systematic” and the Colombian government was not doing enough to protect its people. “The unwavering commitment of COCCAM with the implementation of the Havana Peace Agreement has not been reflected in the actions of the Colombian State to guarantee life, integrity and personal security of our members,” they said in a statement. COCCAM also said that there were issues with payments for those farmers who had already withdrawn their coca crops, leaving them without food. They added that the government should take “immediate measures to guarantee the life, integrity and personal security” of the community leaders. There are more than 100,000 coca farming families in the country but they are under constant threat from drug trafficking groups who are opposed to the government’s plans to eradicate coca, the base ingredient for cocaine. Colombia’s government is in the process of trying to wipe out 100,000 hectares of coca and execute a rural development program as part of the peace deal. But the initiative has caused a surge of violence, as local gangs, illegal armed groups and regional drug traffickers battle it out to take control of areas once controlled by the FARC. Farmers and community leaders willing to take part in the initiative to eradicate coca are targeted by groups who want to take control of the drug trade.